politicalbetting.com » Blog Archive » So what will tonight bring? So what will tonight bring? Will the lead continue to tighten? It’s Saturday night and that should bring two things – the latest polls and the second instalment of the Andrew Rawnsley book in the Observer. 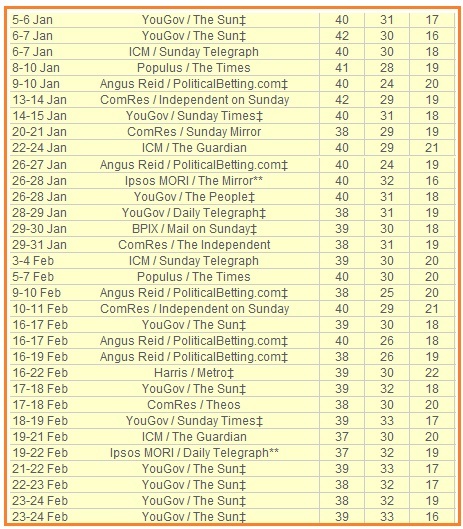 One thing that hits you when you look at the table above is that only the YouGov daily poll has tested opinion since bullygate and the Darling “forces of hell” statement. All the other surveys that have been published this week have been quite old. I’ve no idea what to expect tonight apart from the latest YouGov daily poll in the Sunday Times.